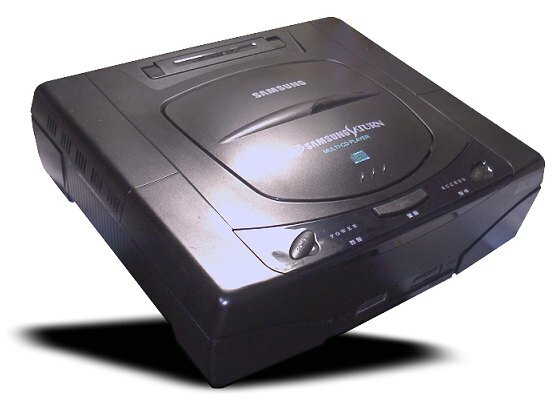 The Samsung Saturn. Talk about elusive. Ask Google about it. If you don't speak (or type) Korean you'll get only a handful of pages listing company names or talking about unrelated news clips concerning the Korean electronics giant Samsung and the Saturn car company. 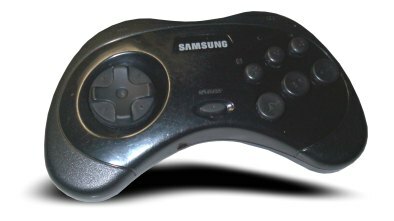 It seems that in 1996, while LG was distributing the 3DO in Korea and Nintendo was distributed by Hyundai, Samsung had no competing game product of their own. 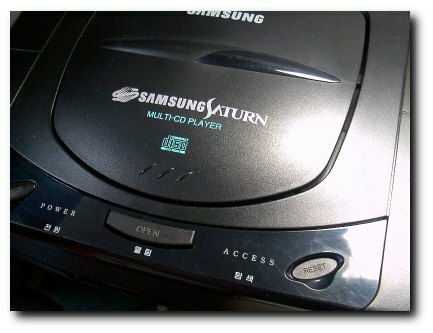 While Samsung had previously sold a bootleg Master System (And a MegaDrive, although it is not known if this was an official or bootleg product) the Saturn was apparently licensed from Sega. There is no Japanese language option in the setup screen. No Korean option was added, just the Japanese was removed. There are no other apparent changes to the bootup menus. The reset switch is very short, and intended for use with a small sub-PCB immediately underneath mounted to the top of the shell. There is only 1 of 2 mounting holes for this PCB to attach to, however, and there's no evidence the single mount was ever used. There's also no sign of an extension rod which could reach the actual reset switch on the mainboard, some 5cm away. This system has no reset button! The CD mechanism has two small bundles of wires in addition to the data ribbon, which is unusual: all the newer mainboards had only one bundle, so again there's a weird combination here. The oval button system has always had two LED indicators on the top of the shell: One for power, one for drive-activity. This unit is no different, except it is! The top of the shell has a rectangular indentation for the LED to be inserted (Again on a small sub-PCB that isn't present in this model) and no acrylic riser to focus the mainboard-mounted LED through the panel hole, some 5cm away. This system has no power light! Even though there's a hole for the activity light, there is no activity LED on either a sub-PCB or on the mainboard. There's an Activity label in both English + Korean but there's no LED!! So what's the deal? The power switch mates perfectly with the top of the shell, and there's no way for the two sub-PCBs to mount to the top, so I don't believe this is a simple hack job where someone's swapped the round-button top for an oval-button one. While it's more than possible for someone to have swiped the acrylic riser for the power LED, what about the Activity LED? No sub-PCB and no mainboard LED, but still they made a hole and labelled it!? It's well known that the Korean electronics industry a few years ago sucked rather a lot, not unlike the Japanese way back when. It seems to me that the Samsung Saturn is a half-assed half-finished system that was simply rushed out the door. I do hope to eventually pick up a second unit, and I look forward to comparing it to this one.